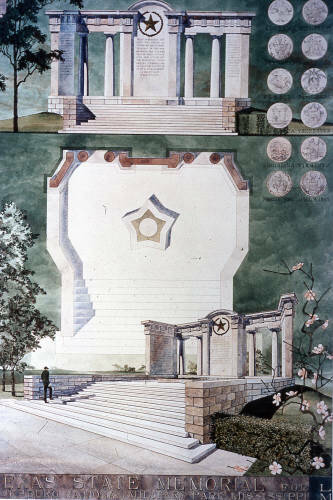 The eleven steps leading to the main portion of the memorial honor Texas' sister states in the Confederacy. A live yucca plant, native to Texas and the southwestern United States, is a unique addition to the monument. The bronze statuary symbolizes all who served from Texas at Vicksburg and captures the spirit of the men who sealed the breach in the Confederate lines. The sculptor was Herring Coe, Lundgren and Maurer were the architects, and the Texas Granite Corporation was the contractor. The memorial lists all Texas units on the defensive line, in Johnston's Army, and in Walker's Texas Division. 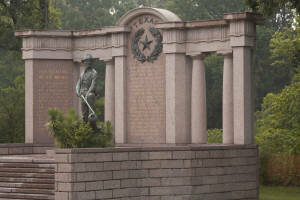 The Texas State Memorial was constructed of Texas red granite and erected at a cost of $100,000. The memorial was dedicated on November 4, 1961, and completed during the winter of 1962-63. - Leonard J. Lundgren, Architect, A.I.A., T.S.A.